For the first time in months, team clover is home for the weekend. There is nothing like experiencing the world through travel, but sometimes home is the place where you can sink into the realities of where you have been and who you are becoming. Thanks to the Apple’s new screen time app (featured below), we will hopefully be spending a little more time with our people and a little less time scrolling. 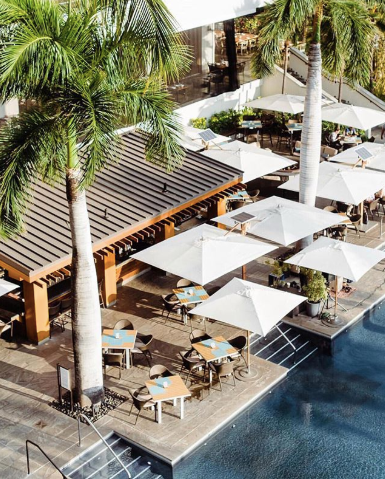 However, while we are soaking in the sweetness of our people and the familiarity of home, don’t be surprised if you catch us experiencing a little wanderlust for places like the Andaz Maui. Crystals are trending in a big way. It seems like everywhere we look someone is suggesting that we add crystals into our lives, whether it’s on our desk or while staying hydrated But where to begin? What stone should we add into our life for the grounding we are looking for? The Chalkboard simplified the process with their quiz that simply tells you to choose three stones from a visual map that you feel attracted to. Done and done. Which ones did you choose? We have all experienced the experience of looking down to your phone for a planned minute only to find yourself still sitting there 45 minutes later with no memory of accomplishing anything. Apple announced earlier this week that their new update comes with an app to help us take control of the time we spend on our screens. The new app will have the function to record and analyze how much time we spend on our iPhones and iPads, breaking it down into time spent on social media, emails, internet, etc. It will also record how much of this digital usage is after bedtime. No more mindless scrolling after we are meant to be getting those zzz’s. Shopping small is one of the easiest ways to positively impact the local economy. We recently heard that since 1990, big businesses eliminated 4 million jobs, while small businesses have added 8 million jobs. In effect, the more you shop small, the more potential job opportunities you could help provide. Taking it one step further, discovering female owned small businesses changing the marketplace makes our hearts sing. A good bunch of these businesses are LA based--excuse us while we get an organic manicure at Olive and June before picking up a paleo caramel cake from Sweet Laurel Bakery. Speaking of shopping small… Do you think our Prime account would cover the cost of a brand new house being delivered? Amazon has released a new tiny home that boasts an open floor plan that includes one bedroom, one bathroom, a kitchen and a living room -- all for the cool price of $65,000. Of course, this doesn’t include the land to put the home which would greatly increase the price in a city like Los Angeles. Either way, it’s a great step in the right direction for affordable housing.